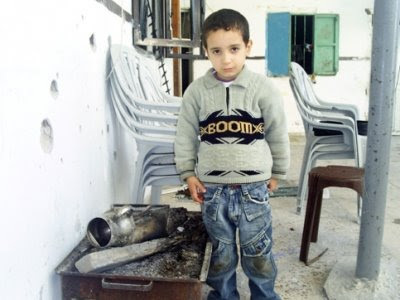 Rami Almeghari wrote "Targeting A Cup of Tea in Gaza,"
Pictured is "Jihad Abu Jbarah in front of the wood stove his family were sitting around when they were killed by Israeli-fired missiles. " 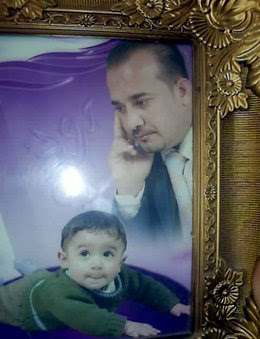 Rami also photgraphed the picture of Dr. Ehab Jasir al-Shaer and his son. Rami wrote "Dr. Ehab Isn't There Anymore." for IMEMC. "How many more will be lost like Dr. Ehab?" Almeghari writes. "As I write this story Israeli warplanes, including American-made F-16 jet fighters and drones, are dropping bombs on my town as they have been for the past few hours, wounding so far five people. The injured may be neighbors of mine, I don't know. Is this really a war against Hamas or is it a war against the people?" killed on the family farm in Beit Lahiya. 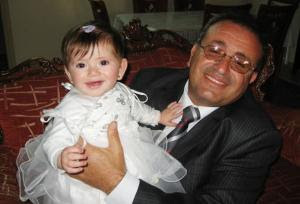 He is pictured with his granddaughter, Fares' niece. Although some decry the reporting from CNN and other western outlets, the fact that western reporters are reporting from Jerusalem or on the border of Israel and Gaza means that for first hand accounts one must seek information from Palestinian journalists, which is illuminating, poignant, insightful, in addition to being informative. I've always been an advocate of "New Journalism," i.e., journalism which incorporates personal history, observation, dialogue, and news reported as it happens with the insight of the reporter thrown in. Not objective, one may say, but what's objective? What the so-called objective reporter includes and excludes is subjective so to speak of objective journalism is to speak of something that has no basis in reality. I found my mother at her apartment which is next door to my own; she was showing the local media the destruction and the window frames that had crashed down on my father's bed. "They killed Akram and now they’re destroying the few belongings he left behind” she was saying. It’s just 10 days since my Dad, Akram, was killed by an Israeli airstrike on the day the ground offensive began. Inside, I retrieved all the baby clothes that we’ve bought for my daughter. It seems we’re going to be away from our home for longer than we imagined. Later Alaa [Fares' wife] looked sadly through the photos I took of the destruction at the apartment where we’ve lived for less than a year. She never expected, she told me, that our baby would spend the first days of her life outside of our home moving from shelter to a shelter. I was unable to speak with my parents all day, and so I rang him just after midnight my time. He sounded wrecked and suffocated, not his usual collected self. "I'm so tired... I'm just so tired. I didn't sleep all night, the bombs are tearing through my head. I really have no idea what's going on outside, nobody has any idea what's going on...Aljazeera in Qatar called to ask me if I knew what was going on...and what this is about anymore. I can't even here anything on the radio anymore, everyone is just praying. I really just want to go now dear, I'm sorry. Goodbye." he ended abruptly. "Is there anything you'd like to tell your daughter?" "What do I tell her? I honestly don't know if I'll live from one hour to the next . . . She keeps asking me to describe the casualties for her that I'm seeing; but I can't. What should I tell her? That I've seen bodies with my own eyes reduced to nothing more than pieces of black flesh?"